On the Spice jet Flight I ask the air hostess for a blanket, she smiles and says, sorry sir, as a rejoinder says. You can have my jacket and cuddle into it. Gosh, I react after a while, was that a pass, As usual I am too dense to react. I think it is a witty remark rather than a pass. By the time I reach Ahmedabad, I have pretty much reconciled to having a drink out of the hip flask, eat an exotic Divij, Ashish or a Nikhil Sandwich (named after the students who invented these at the Chota canteen at MICA) or even a Gunjan Paratha, they sound interesting. I land and Akbar the driver from MICA (Mudra Institute of Communication and Advertising where I am on a teaching assignment yet again), is out there to receive me. We get talking. I ask him for a good Muslim hotel… (meaning dhaba). He recommends some Muslim dhabas in Juhapura in the outskirts of Ahmedabad (a safe haven for Muslims). Juhapura has 4 mosques and about 4 lac muslims living there with the pride of Ahmed Shah Abdali (the founder of Ahmedabad). I am quiet for a while, after 10 mins, he asks, would you like to go. I say “Yes” and abandon the plan of the exotic sandwiches. Juhapura, seems exciting. He is a little surprised with the visiting faculty going with him to dinner at his favorite hangout. We arrive at (pardon my using the politically incorrect word) the ghetto. Juhanpura grew and is now bursting at the seams with Muslim influx after the Gujarat riots. The balance has been struck between the Yin and the Yang. Narendra Modi’s saffron brigade in Velajpura now has been balanced by Juhapura. Hang on I am not interested in politics, I am interested in food. I am busy striking my own balance, last week I feasted on a vegetarian Gujarati breakfast, I now need to sink into a Non vegetarian Gujarati meal. The Yang to counter balance my vegetarian Yin. We reach Sagar fry centre, I have a tot of whisky with Thumbs Up, a bite of masala mutter. There is a Tawa (a large gridle frying meat, chicken , fish, prawns) and on the barbecue there is only, dangerous looking deep red almost pink colored chicken. I ask Akbar to order, he orders two half tandoori chickens, I add a tawa bhuna mutton (our waiter mahim says softly there is only bada, meaning beef, I say that’s okay), now beef and add a half chicken fry masala. The tandoori chicken is large bony and with a fluorescent color. We dig in, its flat and chilly hot and not flavorful like muslim food is supposed to be, besides the Tawa (gridle) at industrial strength temperature kills flavor. The chicken masala fry is laden with mashed eggs and red oily masala, the bhuna beef is a little better and the rotis are dry. There is onions and lemon by the side. The meal of four dishes (two tandoori halves, bhuna beef, half chicken masala fry, six rotis and three cold drinks, cost us Rs 234/- Pretty neat, nearly meets the under Rs 100/- (per person per meal) mark of local exotica at under Rs100/-.I have enjoyed the new experience. Akbar is instrumental in taking me to Sabarmati Ashram on my previous trip and now we feast on Muslim delights in a state with common belief everything is vegetarian other than the Hindu militancy which is not so vegetarian. I later discovered from my friends at MICA I missed the action at Bhatiyar Gali which is the hotbed of Muslim food and Tawa action. Maybe the next time. i guess the food was quite greasy..and not as good as the one in parliament house canteen. the piece was quite well written..overall food in ahmedabad is ok ok it seems...the veg breakfast was average according to you. Yeah, it is perilous not to make calls to your friends even when they are expecting for you and waiting to hang out with hands 'full'. Next time give a call so that Bhatiyar gali is conquered. good one sir..and if you actually clicked the spice jet air hostess in action then it is a great documentation with narration. 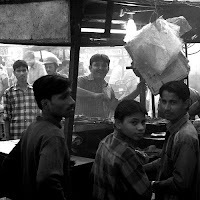 You been lucky to taste good meat in Ahm..we were not so, whilst working for long periods in Ahm & Surat. And sir if yu get a chance have a dig at the kathiawadi food (veg only) especially as Sasan Gir then pl do so and review for us. It is awesome.